Anyone else get the seasonal speed boost? I've noticed when the weather becomes colder the speed that my connection resync's at increases slightly. Re: Anyone else get the seasonal speed boost? I observe an annual cyclical change in the Hlog plot for my (ADSL2, ITU-T G.992.3) circuit. The hotter the weather the poorer the plot, the colder the weather the better the plot. My old VDSL line was always better during the winter. Yesterday I saw my router sync at below 79998 for the first time so I'm not seeing any benefit. Services delivered over metallic paths are subject to changing conditions depending on the weather. This can be seen most easily on cable networks where receive and transmit power can change as the coax shrinks and expands due to temperature and its conductivity changes. Firstly, suppose you have neighbours who are less concerned with connection speeds than we, on this forum, are. They leave everything alone. At this time of year, with longer hours of darkness, owing to well understood variations propagation of radio waves in darkness, their own connections may experience higher error rates. If these error rates are bad enough, your neighbours’ connections may drop and reconnect in middle of the night. That will happen, by definition, during hours of darkness so by competing with the interference, they will reconnect at a poorer speed. Subsequently, if you then force a reconnect in daylight hours, you will negotiate a speed that is not impacted by the interference that goes with darkness. But better still, because your neighbours’ speeds have dropped there will be less cross talk, so your speed will be even higher than its usual ‘daylight’ value. Unfortunately you can’t beat natural phenomena so if above is the explanation I’d expect the faster connection to be all the more fragile in hours of darkness and itself perhaps, to reconnect in middle of the night. If that happens regularly, DLM may start to intervene and then, your speed might be worse than ever. I think speeds are always better in the winter. And very bad weather seems to help a little, v heavy rain. Lying snow seems very beneficial. However the power cut boosted d/s one sync rate to the highest speed ever seen in all of history, 3.2Mbps. This must have been due to the unusually low noise level at the time as other disturbers were still offline, that is the only explanation I can think of and it doesn’t entirely make sense to me. Why would my kit come back up sooner than other people’s? I don’t see why my modems would boot fast than other people’s, the opposite in fact. Perhaps it is nothing to do with modems and was about a wide range of electrical equipment still being off and not restarting without intervention ? Don’t really understand. Anyway, that is still giving a false boost to performance figures. The weather is really wild here today. Has been quite wet. My d/s attenuation swings between 21.5 in summer and 19.5 in winter. The ground’s not quite cooled enough yet - still at 20.7, but we’ve still got winter-proper to come. I go as low as 54Mbit attainable in summer to 59 in winter. Plus, my HG612 usually syncs a megabit or two above the attainable rate - so by January I’m often in the 60Mbit club, which isn’t too shabby for a ~600m line! All of my lines are now running at crazy high downstream speeds, with no tweaking. 3.19, 3.02, 3.12, 3.11 Mbps downstream sync rates. Never seen anything quite like these. Line 2, the sluggardly relatively, is the new one. 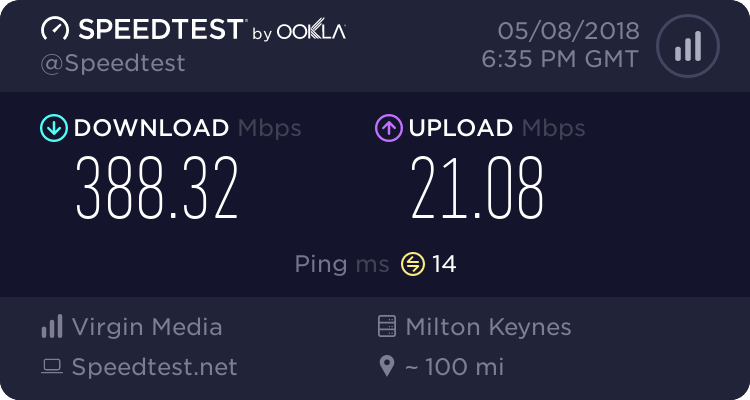 Upstream sync rates are not unusual: 528, 496, 358, 499 kbps - don’t know why line 3 is so rubbish upstream, went through a period of being ok, over 100k better. Assuming the cold weather theory is not bogus, does anyone have any ideas as to why such a thing might be the case? Nah, Huawei. May well actually be closer to 700m.